This post started a couple weeks ago when I twittered that I was pulling tarot cards for a flash fiction story I was working on. It sparked a discussion and several people wanted to know more how about how I was using tarot cards in my writing process. The most interesting characters are flawed. They have needs, wants, and pains that, may not be directly relevant to the story, are to who they are and how they behave. Discovering those traits about my characters is part of my process. I’ve watched my wife pull cards for people before, and I have a deck of my own that I bought because it suited me (har har). In my headstrong, obstinate way, I thought, I can do that, too, but I never did. I didn’t have a reason to until I was working on a story recently and felt a bit stuck. I dug my Druid Animal Oracle Deck out of the box they’d been hibernating in and asked her for help. How does the character feel about themselves? How do others feel about the character? I had rough idea of what the story wanted to be and who the two main characters were. The main character is a young mother with some rather special talents, and honey does she have some man troubles. I already knew both character’s backstory but not their current one. With that in mind, I considered the woman and began. After shuffling the deck, I took a fifth or so of the cards and inverted them and shuffled again. I drew four pair of cards, two for each of the above, and laid them out on the table. The first pair revealed the inverted Swan and Cow, which tells of pending separation, coming to terms with the end of a relationship, and motherhood and the protection of a child from harmful influences. The second pair was the Hare, indicating the potential for change, rebirth, and balance, and Ram, representing sacrifice and inner strength. 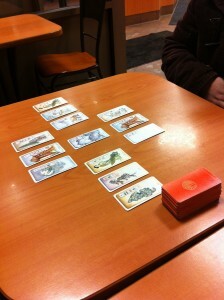 The penultimate cards were the Wren and the Frog. The Wren speaks of cunning and humility; she sees beauty in all things. She’s gentle, subtle, and well-intentioned. Finally, possible outcomes, and I turn over the Earth and Water Dragons. The Earth card represents coming face to face with potential, previously denied by the subconscious. Unlocking the secrets of the heart will uncover the power and beauty within. The Water Dragon is revelations and overwhelming emotions that lead to a greater sense of connection to life. Now, all of this is wildly open to interpretation. Viewed through the lens of artistic vision, my own subconscious interpreted the cards and rushed to fill in the blanks. I ended up with all the pieces I needed to write a story that I’m pretty damn happy with. I suppose the same thing could have been accomplished with dice and a look-up table of traits and attributes. Regardless of the trick used, this was an exercise in poking the muse. It worked well for me and I’ve continued to use it for other stories and characters. I should note that decks aren’t terribly expensive. The Druid Animal cards I use can be had for less than $11 on Amazon. I chose that deck because I like the artwork on the cards, I like animals, and Druids rock. You can find thousands of different decks to be had. Find one that works for you and give it a try. I use tarot cards to break through writer’s block. During one NaNoWriMo, I made a shaman character go through the underworld on a voyage mostly inspired by the Fool’s Journey through the colorful and symbolism-rich major arcana. I wrote 8000 words in a single day, and the material that came from that day were good enough to reuse in other stories. I like using astrology, too. It gives some great ideas for not only basic personalities, but the personality flaws that can make a character their own enemy. My current MC is Aries-inspired — he’s too stubborn and goal-focused for his own good. My mom surprised me the other day with 2 tarot decks: Cthulu and dragons. We’ve already got the Science Tarot and an art tarot we got for her a while back, and now I have a traditional tarot ordered. So, of course, I’ve been playing around with them while I get ready to draft new stories. Thanks for the idea, Adam, and I look forward to reading more tarot-inspired stories! I want to collect more decks now that I’ve started. I imagine that certain decks will lend themselves more to different kinds of stories. The Science Tarot looks awesome, but may not ship to Canada yet. I totally agree re: different decks inspiring different stories. I collected decks for a while, and have about a dozen. My fave is one that is both Japanese and reverses all of the gender roles in the traditional Rider-Waite deck on which so many others are based.